Here are all the steps to create a character sheet! A character sheet gathers infos for role playing games. It contains several fields (name, level, tribe, hit points, school, etc.) and a picture. Field of the character sheet cannot be updated automatically, they have to be modified by the game-master or an admin, respectively the user himself. "Admin Panel => Modules => Roleplay Game => Fields Management" -> Set "Display the Character Sheet" to YES. Once saved, the RPG mode is activated. "Admin Panel => Modules => Roleplay Game => Fields Management"
This page summarizes all fields already created. It's possible to delete or edit them, or change their display order. Click on "Add a field" to create a new entry in the character sheet of all members. Field Name: As the name implies already, this is the label of that field. Order: The value 1 would make that field appear at the very top of the character sheet. 50 would be displayed at the very bottom. Everything else accordingly in between. Default Value: When a member generates his sheet, the field will have this value by default. Modifiable by the member: If ticked, the member can modify the field themselves. Visible in the forums: If ticked, this field will appear in posts, under the avatar. You cannot display more than three fields there. Text field: It's simple text, in one line. Useful for a name, age, the departure place, etc. Choice list: It's a list of circular tickable checkboxes. Useful for the character's tribe, his/her class, etc. Then you have to fill up all the choices, one by one (maximum : 15) and define one default choice. Text/list: It's text on several lines. Useful for the character's description, a list of all spells the character knows for example. Table: Creates a table. You can add columns and lines. To delete an already added line or column, delete the text of the respective entry and click "add/remove". 3. Further customize a field's appearance! "Admin Panel => Modules => Roleplay Game => Fields Style"
This page summarizes the styles of all fields. To change a field's style -> Click on "Edit" of the appropriate field. To generate a character sheet, a member must log in, click on "Profile" in the navigation links above, then on Character Sheet. If his/her character sheet hasn't been created yet, it will be proposed to him/her to do it in his profile as well. He/she can then fill up all modifiable fields. In the forum, the character sheet can be visible in his/her profile or in a message he/she posted (under the avatar). "Admin Panel => Modules => Roleplay Game => Generate the sheets"
"Admin Panel => Modules => Roleplay Game => Character sheets"
You have the option to roll a dice when posting that returns a random number or a random image. There is by default a dice created at the time of activation (simple dice with 6 faces). It is possible to change the wording "Roll dices" (to for example: lottery results). "Modules / Roleplay Game / Dices Roll" >> "Change the wording"
"Admin Panel / Modules / Roleplay Game / Fields Management" >> User "Game Master"
"Admin Panel / Modules / Roleplay Game / Dices Roll" >> "Add a dice"
Default image of the dice (it represents the "name" of the dice): it is an image which represents the dice (obligatory). Set the amount of faces for your dice and hit save. Edit your new dice by clicking on the icon. 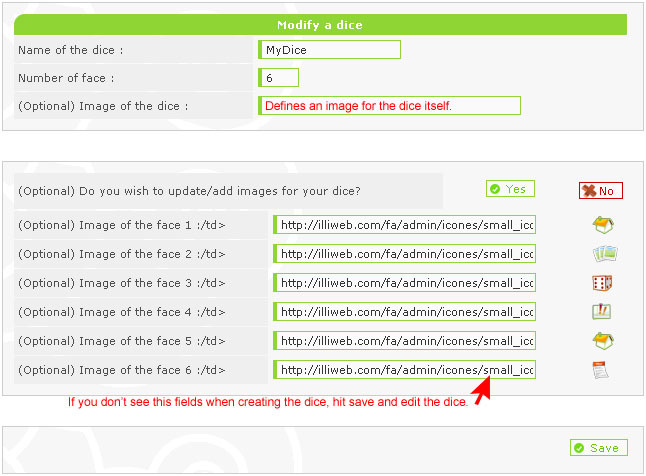 You should now see image fields for each face of your dice. If you leave it empty, the according number will appear if it's rolled. To roll the dice, a member must post a message (not a quick-reply). Right below the "Send" button, there is the list of all available dices (see screenshot above). You must chooe which one to roll, and choose how many times you want to roll it (default is "1"). In addition of your own post, the game-master will automatically post a message with the results of your dices roll. It is thus advised with the admin to create a new account which will be used only as a Game Master. Notice: You can't roll a dice while creating a new subject or editing a message. The dices options won't appear in this cases. This tutorial was written by Gautamas.